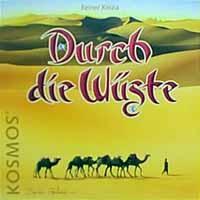 Durch die Wüste (Through the Desert) , Reiner Knizia, Kosmos, 1998. Categories: board, family, strategy, tile-placement. Resources: Rules (Knizia,Jacklin), Rules (KC Picha). Durch die Wüste (Through the Desert) is an abstract game in which players place camels to score points. The game is full of tough tactical decisions, long-term strategic decisions, multiple methods of scoring, and very little luck. In other words, all the makings of a classic strategy game. As many gamers on the internet have pointed out, this game is part of a informal series of tile-placement games by Reiner Knizia having similar features and mechanisms. The other games in this trilogy include Euphrat & Tigris and Samurai , which were released roughly one year before and after Durch die Wüste . Since then, Reiner Knizia's Rheinländer has been released and fits nicely into the "trilogy" also. First let me explain the rules a bit. There are five colors of camels in the game with each color group containing 34 camels. A player places a camel on the board such that the camel joins the player's existing caravan and does not adjoin an opposing player's caravan of that color. For instance, a green camel extends your green camel caravan, and it also blocks other green camel caravans from nearing that spot. During a turn a player places two camels of any color. Once placed, the camels do not move or get captured. Each person has five camel jockeys to mark the ownership of the caravans. pick up water holes - A camel placed on a water hole tile scores the number of points on that tile. The tiles come in 1, 2, and 3 point denominations. reach an oasis - A camel caravan that touches an oasis, most excellently represented by a plastic palm tree, scores 5 points. surround an area - A caravan that ropes off a group of hexes, either to a board edge or the mountain hexes on the board, such that the group contains no opposing camels, receives 1 point per enclosed hex. create the longest caravan - At the end of the game, the longest caravan in each color receives a whopping 10 point score. The game ends when one color of camels has been completely played so players have control over whether to extend or curtail the game. One nice feature of the game is that all the scoring methods are represented by tile counters. There is no need to keep a paper log of the score. Simply count your score tiles at the game end and see who wins. The placement rules of Durch die Wüste are reminiscent of Hex , a game developed by Princeton student Piet Henning in the 1920's. Both are played on hexagonal boards and, once placed, pieces are not moved or captured. Although Hex is a two player involving two colors, Durch die Wüste can be more than two player and involves five colors. So whereas in Hex the black and white pieces tend to race for the edges in the end game, Durch die Wüste offers the option of continuing a race to the edge, or parrying a race by creating a threat in another color. The water holes and oases add much more flavor, variety, and sophistication to Durch die Wüste . I can think of all sorts of derivative games that use rules from both Hex and Durch die Wüste . Like many of Knizia's games, the scoring system is honed to a fine balance. After many plays, I can't assess which method of scoring or strategy is more valuable. I've seen wins with lots of water holes and oases. I've seen wins with lots of enclosed hexes. And, I've seen wins with two or three long caravans. I enjoy figuring out a move that scores in more than one category, for instance, placing a pink camel that touches an oasis (5 points), encloses a large number of hexes (1 point per hex), and creates the longest pink caravan (10 points). Unfortunately that longest caravan score is not awarded unless you can hold on to it to the end of the game. So the advice here is to play each camel to score as many points as possible tactically. However, be aware that the "longest caravan" and "enclosed area" scores can be quite large, so keep these in mind for the long term. As in many multi-player games, it helps if your opponents are fighting each other, and you are somehow able to advance unmolested. Often the unnoticed player can build up an insurmountable lead, so use your diplomatic and deceptive skills to their maximum. For your turn, choosing two camels of one color is a good way to telegraph your intentions to your opponents. Avoid it if possible. Slyly building caravans one camel at a time can often go unnoticed. Be sneaky. Another point to note is that the number of players creates different games. A two player game is very cerebral and high in strategy. A player can form longer strategies. Tactically, each attack by your opponent may be answered quickly. The five player game is much different. Long-term strategies are more difficult to play, and the changing board shortens your planning horizon considerably. My only slight gripe with the game is the fixed board. I would enjoy mountain tiles that would add even more variety to the board setup. On the other hand, I recognize the immense amount of work and playtest that went into the game. DDW has such a balanced and tested feel to it, that I imagine moving mountains would be difficult even for Knizia. Changing virtually anything about this game (more colors, more camels, more players) would make it less stable. Which of these abstract tile-laying games do I enjoy the best? I find the multi-color tile laying mechanisim to be most similar in Durch die Wüste and Euphrat & Tigris . It really is a brain bender to keep those expanding blobs of color in logical perspective. It is sort of like playing multiple games of Go at the same time, on the same board! Both games give me mild headaches after prolonged exposure. Of all the games, I really enjoy the scoring system in Durch die Wüste the best - count the tiles and figure your score. I always disliked the convoluted scoring system in Samurai - too long to describe in this review! I also enjoy that Durch die Wüste is very low in luck. Although the board is set up randomly, once set, all players are using pure brain power to figure which color camel to play and where. Euphrat & Tigris on the other hand is slightly luck driven because you are playing from 6 randomly chosen tiles per turn - one lucky tile draw can garner you an extra point at the end of the game. Finally, I would say that I enjoy Durch die Wüste the most because it is just so darn visually appealling. The camels, riders and trees are three dimensional, and the tutti-frutti color scheme is enough to make any spectator smile. First time viewers often roll their eyes and question how anyone can make any sense of the Fruit Loop colored pieces on the board. Board gamers who like abstract and lightly-themed games will enjoy Durch die Wüste very much. Also families and casual gamers will enjoy Durch die Wüste more than the more complex Tigris & Euphrates or Samurai . For any other club or collector that needs a positional game to round out a good set of game, Durch die Wüste is highly recommended.